Größe dieser Vorschau: 517 × 599 Pixel. Weitere Auflösungen: 207 × 240 Pixel | 718 × 832 Pixel. Español: Cabeza humana con la mitad superior del cráneo extraída y la duramadre separada hacia los lados, exponiendo el cerebro. La colocación de la muestra refleja el elevado nivel estético que se encuentra en todo el trabajo. 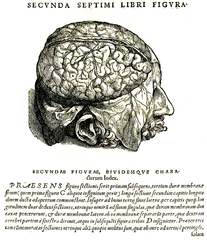 This image is from plate 606 of Andreas Vesalius' famous De humani corporis fabrica libri septem, published in 1543. Original image of plate from U.S. National Library of Medicine. This version cropped & contrasted. There are few books so famous as the Fabrica, and fewer still which have had so profound an influence. Vesalius' work was the first complete and systematic treatment of human anatomy, the result of careful study of human, rather than animal, dissections. The Fabrica was a corrective to the dogmatic traditions of the time which, with its extravagant admiration of antiquity and excessive confidence in the writings of, in particular, Galen of Pergamon, had led to a systematized body of anatomic and medical instruction riddled with error and inaccuracy. The work represented by the Fabrica was one of the first important steps toward the development of a modern, scientific medicine. 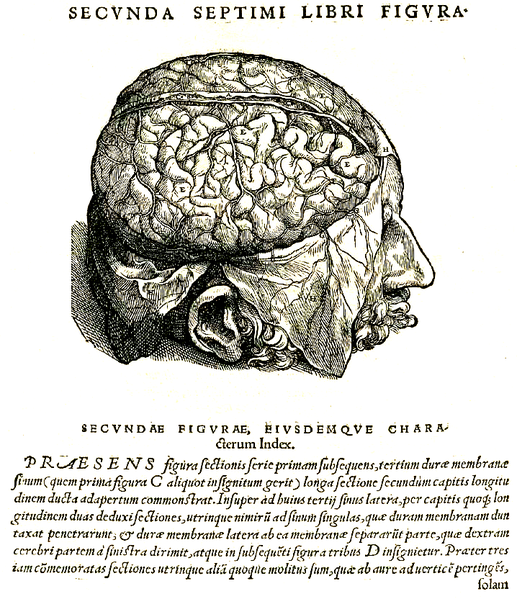 This image on plate 606 shows a human head with the top half of the cranium removed and the dura mater (brain covering) peeled back over the sides of the head, exposing the brain. The arrangement of the specimen reflects the high aesthetic character of the entire work. aktuell 17:17, 5. Okt. 2005 718 × 832 (331 KB) Encephalon~commonswiki Image balancing perfomed: Gamma at 1.47, blue.